Elliott Wave Theory is one of the most popular prediction model to speculate the direction of prices in Stock Market. It was developed by R.N. Elliott and got popular through the efforts of Robert Prechter. Elliott Wave theory is primarily based on Dow theory which asserts that stock prices moves in cycles. These cycles are a result of mass psychology which shows up repetitive patterns when applied on stock charts. Every single element of these patterns are termed as waves in Elliott wave theory. In this post we would understand Elliott Wave patterns in detail and learn how to compute waves in Elliott Wave Analysis Excel Sheet. This excel sheet is downloadable at the end of this post. 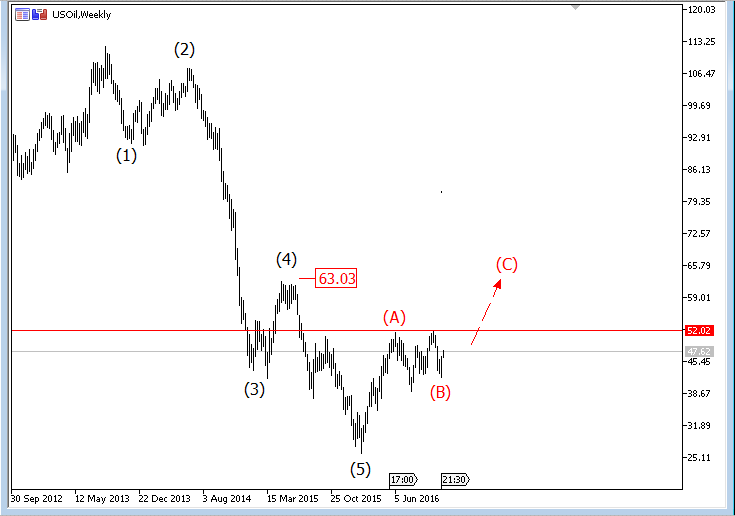 As per Elliott Wave Theory, a combination of 8 waves constitute a complete price cycle. 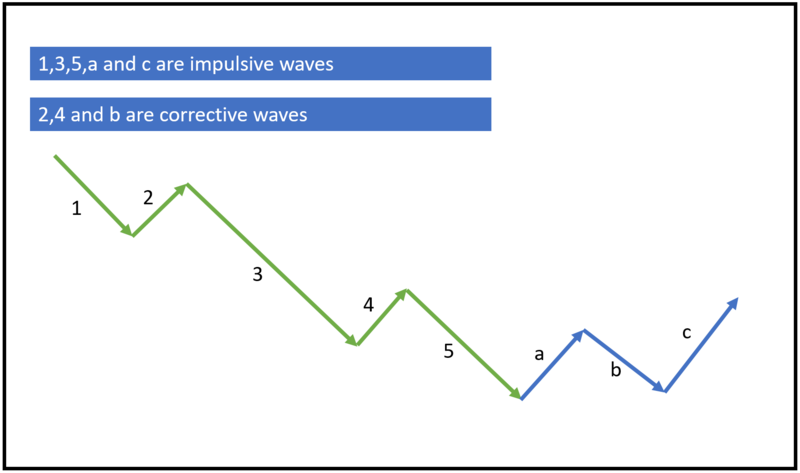 Out of these 5 are called Impulsive waves and 3 are called Corrective waves. When the primary market trend is bullish, impulsive waves are in direction of trend (upwards) while corrective waves are opposite to the trend (downwards). 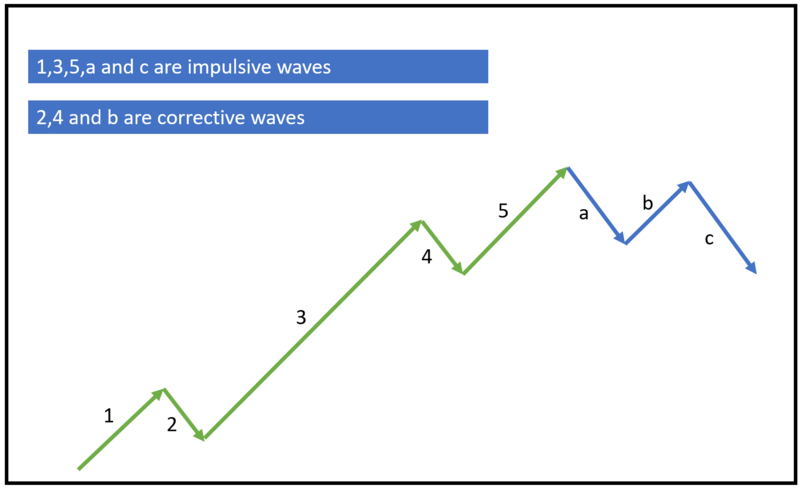 Similarly, when the primary market trend is bearish, impulsive waves are in direction of trend (downwards) while corrective waves are opposite to the trend (upwards). The above pattern formation does not depend on timeframe. You can observe Elliott wave patterns in intraday charts as well as monthly charts. However, the probability of false waves decreases in higher time frame charts. Inputs Number of candles (B5,B16) Number of candles or bars wave 1 lasted. Step 2: Open this Excel file and input parameters for wave 1 in the highlighted yellow cells. 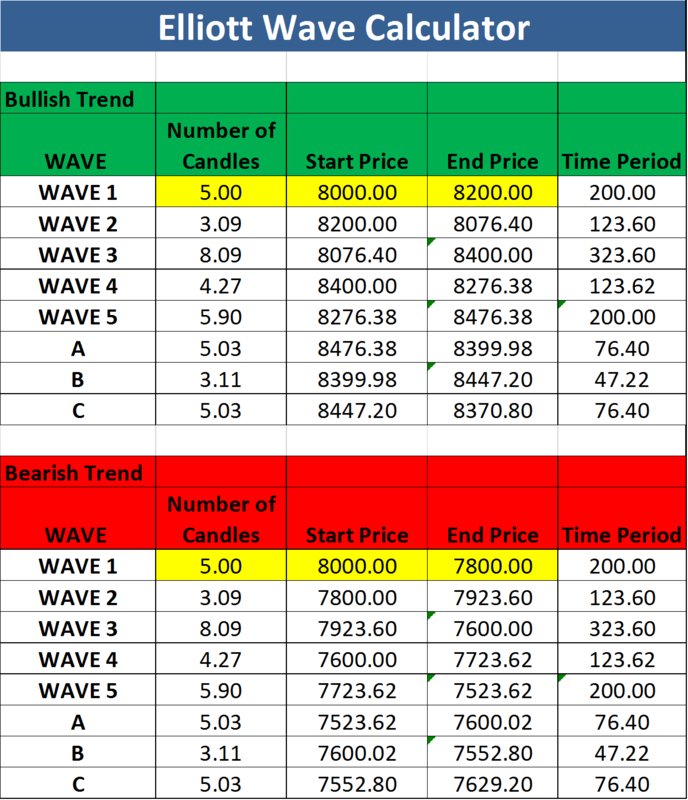 Step 3: Check probable range of other waves and plan your trades accordingly. Could you please enlighten us how to use this i.e in highlighted area we have have to enter the last day data or last 5th day data? what the wave 2,3,4,5 and ABC are indicating? One more thing I am working on my option strategy project so could you help me how to calculate Implied volatility in excel for indian market? Request you to read the article once again. Pretty much all of your questions are answered there. Why do you want to calculate implied volatility, its already available in NSE website. Hi, thanks for the article . I want to know from where to get the Number of candles no. And what is this start price / end price. What would the time period 200 mean over here? It means 200 candles. So if you are studying 1 min chart, it would be 200 minutes. Just needed a Clarification .. if i am looking at a weekly chart , the time period that i get is to be considered as weeks or days? It should be weeks for weekly charts. I would like you to make it clear as to what and how to fill the yellow figures. there is no mention of this in the article. I went through it several times. If i want do intra-day trading, then how much should be the figure in place “5” as per the time frame the trader will use? Is it that, if i am observing 5 min candle then the figure will be five? how to pick at the start price and end price? Are these the figures of previous day or on the day of trading? and exactly what? You need to manually detect Wave 1 and fill in the details in the Excel. The value 5 signifies number of candles Wave 1 lasted, it is independent of the timeframe you are trading. Similarly, Start and End price signifies the start and end price of wave 1 which you need to manually observe and enter. link missing. not available for download please clearly show where it is. too much of nuisance.